Grade 2 through 5 readability levels. Improve word recognition, vocabulary, understanding of multiple meanings, and grammar using the activities in these books. The difficulty level ranges from Grade 2 readability to Grade 5 readability. 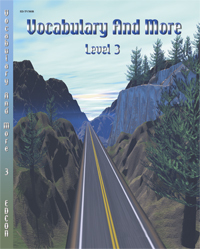 Students will enjoy these modified CLOZE format vocabulary workbooks and, at the same time, increase vocabulary skills, improve word recognition and understanding of multiple meanings. Basic vocabulary skills are reinforced through the use of modified CLOZE procedures and multiple-choice questions. The degree of difficulty progresses from lesson to lesson and level to level. Use these book to develop basic vocabulary and other skills relevant to literacy. The four books each target a different reading level (2nd, 3rd, 4th, and 5th grade readability). These books are often used by reading specialists, learning disability specialists, speech pathologists and others to strengthen vocabulary and other language skills that are critical for success in reading.